Six months after the nuclear meltdowns in Fukushima Prefecture, the public’s awareness of the threat posed by radiation is entering a new phase: the realization that the biggest danger now and in the future is from contaminated soil. The iodine-131 ejected into the sky by the Fukushima No. 1 power station disaster was quickly detected in vegetables and tap water — even as far away as Tokyo, 220 km south of the plant. But contamination levels are now so low they are virtually undetectable, thanks to the short half-life of iodine-131 — eight days — and stepped up filtering by water companies. But cesium is proving to be a tougher foe. The element’s various isotopes have half-lives ranging from two to 30 years, generating concern about the food chain in Fukushima Prefecture, a predominantly agricultural region, as the elements wash fallout into the ground. The root of the problem is, well — roots. Cesium-134 and cesium-137 are viewed as potential health threats because vegetables can absorb the isotopes from the soil they’re planted in. “Until early spring, produce was contaminated (on the surface with radioactive materials) that the No. 1 plant discharged into the atmosphere. But now, the major route of contamination is through plant roots,” said Kunikazu Noguchi, a radiation protection expert at Nihon University. Whether absorption by plant roots can affect human health remains to be seen. Experts are warning that the region’s soil and agricultural products will require close monitoring for many years. At the moment, sampling data collected by the various prefectural governments indicate that no vegetables, except for those grown in Fukushima Prefecture, have been found to contain more than the government’s provisional limit of 500 becquerels per kilogram since June. Likewise, as of Sept. 7, samples of pork, chicken, milk and fruit had also tested within the provisional radiation limit, apart from Fukushima products and tea from Chiba, Kanagawa, Gunma, Tochigi, Saitama and Ibaraki prefectures. In fact, the amount of radioactive materials in most of the food sampled has been steadily declining over the past few months, except for produce from Fukushima. “The results of Fukushima’s sampling tests show the amountof radioactive material contained in vegetables has dropped sharply in recent months, including those grown in areas with high radiation levels,” Noguchi said. 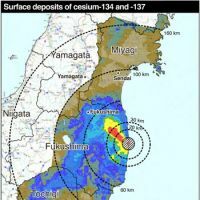 Now that soil in a wide area of eastern Japan has been contaminated with cesium, experts are calling for close monitoring of soil and produce. The education ministry conducted soil surveys in June and July at 2,200 locations within 100 km of the crippled plant. 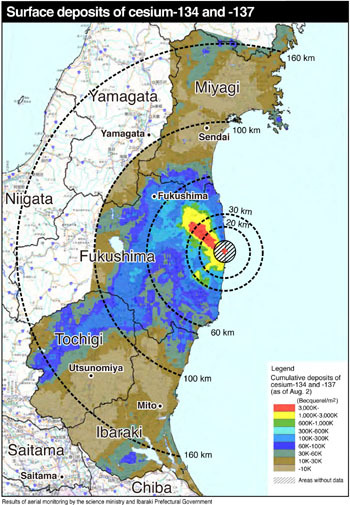 At 34 locations in six municipalities in Fukushima Prefecture, including Minamisoma, Namie and Iitate, the data said cesium levels had exceeded 1.48 million becquerels per sq. meter — the same level that was used to define the exclusion zone around Chernobyl in 1986. Yasuyuki Muramatsu, a radiochemistry professor at Gakushuin University, said that agricultural contamination will likely peak this year because cesium binds more strongly with minerals in soil as time passes, making it more difficult to be absorbed by plant roots. “Data from the Chernobyl disaster show that radioactive cesium in soil tends to become fixed more strongly to clay minerals as time passes. So agricultural contamination will lessen next year,” he said. Muramatsu urged that special caution should be taken over products grown in soil rich in organic matter, such as in forested areas. “If the soil is rich in organic matter, it makes (cesium) more easily transferable to plants. . . . Forest soil is rich in organic matter, so people should be careful,” he said. “This year, it’s very important to conduct thorough surveys. The contamination will continue for a long time, so data collection is essential,” Muramatsu said. “We need to be prepared for the following years by recording data this year and studying the rate at which cesium in the soil is absorbed by each kind of produce,” Muramatsu said. In the meantime, the radioactivity itself will continue to weaken over the years. Cesium-134 has a half-life of 2 years and cesium-137 a half-life of 30 years, meaning the radiation they emit will drop by half in 2 years and 30 years. The ratio of cesium-134 to cesium-137 in the Fukushima accident is estimated as 1-to-1, while the ratio during the 1986 Chernobyl disaster was 1-to-2. This indicates the radiation in Fukushima will weaken at a faster rate than at Chernobyl. Between April and early August, the farm ministry tested soil at some 580 locations in six prefectures, including Fukushima, Tochigi and Gunma, to get a better picture of the full extent of contamination. According to the results, 40 locations in Fukushima Prefecture had an intensity exceeding 5,000 becquerels per kilogram — the government’s maximum limit for growing rice. Many municipalities within 30 km of the Fukushima No. 1 plant were banned from planting rice based on similar tests conducted in April. In addition, the ministry has asked 17 prefectures in eastern Japan to conduct two-phase radiation tests on harvested rice. So far, none of the tests performed on unmilled rice — including from Fukushima — exceeded the government’s limit of 500 becquerels per kilogram. Masanori Nonaka, an agriculture professor at Niigata University who specializes in soil science, said rice grown in contaminated areas is likely to be tainted, but to what extent is anyone’s guess. White rice, however, may prove to be safe, Nonaka said. Because most of the radioactive material will adhere to the bran — the part of the husk left behind after hulling — about 60 percent of the cesium can be removed just by polishing it, he explained. Other foods, such as marine produce, won’t be as easy to handle, experts say. After the Chernobyl accident, for example, the radioactive contamination of fish peaked between 6 to 12 months after the disaster. The Fisheries Agency, meanwhile, has asked nine prefectures on the Pacific coast to increase their sampling rates to prevent contaminated fish from landing in supermarkets.